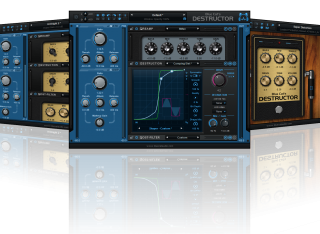 You will find here some custom presets to use with the Blue Cat's Destructor product. Description: A preset to match Brian May's unique lead guitar tone in Queen's "Bohemian Rhapsody ". Demo video: Brian's Rhapshody demo. The preset was designed for a bridge position humbucker pickup. You may need to remove some treble in the preamp section if using single coils. Description: A heavy distortion preset for guitar, as demoed in Ryan's Destructor Video. Description: Modern Metal Presets for Destructor. Audio demos available here. Description: Inspired by Mark Knopfler's on Dire Straits' "News". Demo video: Knopfler News tone demo. This preset uses a lot of compression - you may need to adjust the input level to your guitar and playing. Description: Eddie Van Halen's legendary brown sound matched from Van Halen's "You Really Got Me", as explained in this guitar tone matching video. Demo videos: EVH Eruption demo / EVH Mean Street Demo. Description: 4 presets that mimic Jimmy Page's legendary guitar tones in Led Zeppelin's "Whole Lotta Love". Demo videos: Lead tone demo / Rhythm tone demo.